Dimensions: 5 7/8 x 7 7/8 in. Typical pencil annotations on impressions from the edition: Just below the plate mark, signed and dated, l.r. ; titled, l.l. 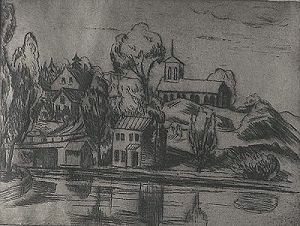 Title and Setting: The only observed impression of this etching bears the title "Eddyville," in pencil, l.l. 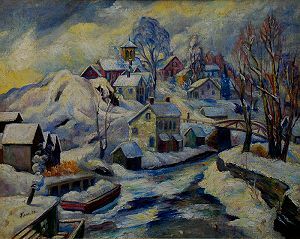 Eddyville is a village in Ulster County, New York, just west of the Hudson River, south of Kingston and not far from the artist colony of Woodstock where Fiene maintained a home during the 1920s. Scenes from this area were common in his painting and printmaking during this period. See Riverboat at Rondout. The body of water in the image is most likely the Delaware and Hudson Canal, which runs through Eddyville. *Date: The only observed impression of this etching is dated in Fiene's hand, l.r., just after his signature: "24--". A catalogue of Fiene's exhibition at the New Gallery, New York City, in 1924, includes a portfolio of eleven unspecified etchings but no prints in any other medium. Presumably this is one of them. In 1923, Fiene studied etching at the Art Students League in New York City under Joseph Pennell and Eugene Fitsch. It is likely that the eleven etchings in the New Gallery show (including catalog #s 13-16) are related to that study. **Medium: Only ten Fiene prints in a medium other than lithography, all of which are intaglios -- etchings, aquatints and drypoints -- currently have full entries in the catalogue (Click here to view them.). Although others exist, information about them is currently incomplete. ***Edition: Other etchings and drypoints with known editions from this period of Fiene's printmaking have editions of twenty and twenty-four impressions. ****Printer: Fiene printed some of his early etchings himself, indicating this by writing "Imp" (Impressit, Latin for he/she printed it) after his signature. This may be the case here.